Self portraite as old man. Collection from Louvre. Katsushika Hokusai (葛飾北斎) (October 31, 1760 – May 10, 1849) was an Edo period Japanese artist, painter, woodblock printmaker and ukiyo-e maker. Born in Edo (now Tokyo), Hokusai is best-known as author of the woodblock print series Thirty-six Views of Mount Fuji (c. 1831). Through his painter life, Hokusai switched his pseudonoms thirty times. Among them, Hokusai (used 1805-1810) is today preferably used to address him. All I have produced before the age of seventy is not worth taking into account. At seventy-three I have learned a little about the real structure of nature, of animals, plants, trees, birds, fishes and insects. In consequence when I am eighty, I shall have made still more progress. At ninety I shall penetrate the mystery of things; at one hundred I shall certainly have reached a marvelous stage; and when I am a hundred and ten, everything I do, be it a dot or a line, will be alive. I beg those who live as long as I to see if I do not keep my word. 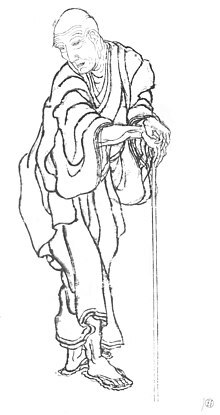 Written at the age of seventy five by me, once Hokusai, today Gwakyo Rojin, the old man mad about drawing. On one of his pseudonom, Gyakyo Rojin. He may have said the above in his late life definitely, since he began to use the name Gwakyo Rojin in 1843. Museum of Fine Arts, Boston Database with approximately 760 images of Hokusai print. Go to Collections and do a search. Personal Webpage on Viewing Japanese Prints. General background on Hokusai, Edo and Osaka Ukiyo-e, and other print artists. This page was last edited on 31 May 2018, at 20:10.